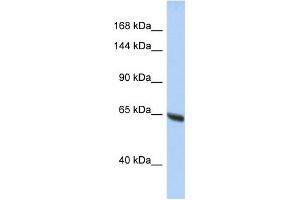 Characteristics This is a rabbit polyclonal antibody against SYNE3. It was validated on Western Blot. Background SYNE3 is a component of SUN-protein-containing multivariate complexes also called LINC complexes which link the nucleoskeleton and cytoskeleton by providing versatile outer nuclear membrane attachment sites for cytoskeletal filaments. It is involved in the maintenance of nuclear organization and structural integrity. It is a probable anchoring protein which tethers the nucleus to the cytoskeleton by binding PLEC which can associate with the intermediate filament system. SYNE3 plays a role in the regulation of aortic epithelial cell morphology, and is required for flow-induced centrosome polarization and directional migration in aortic endothelial cells.